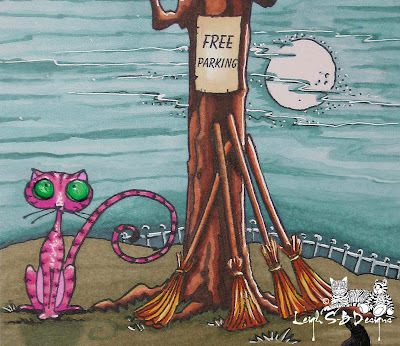 Velvet Paw Creations: " Free Parking Kitty Attendant " - A 3rd Coast Creative Coterie Halloween themed Card!
" 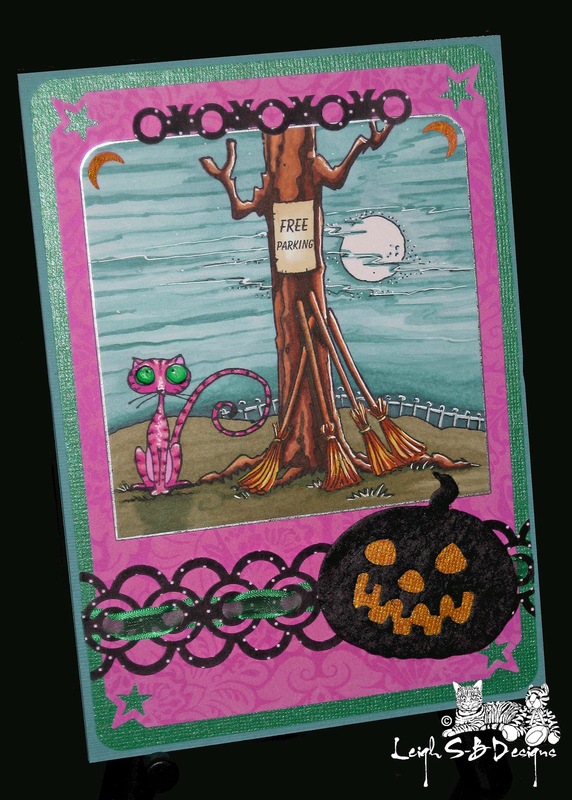 Free Parking Kitty Attendant " - A 3rd Coast Creative Coterie Halloween themed Card! The main feature of my card is the awesome stamps available from Third Coast Rubber Stamps of course ;0) I adore that kitty cat which is part of the Scary Hairy Girl and Cat combo - VB-321-P and the Free Parking tree - AP-479-P is so much fun to use in scene stamping and is one of their newest Halloween releases! Stamp the tree and the cat images in Memento Tuxedo Black ink on white cardstock that is suitable for working with Copics. Use a square Spellbinders die to cut out the panel and colour the scene with various Copic markers. I used the colourless blender Copic to fade out the sky and grass areas of the scene. The blender pen acts more like a bleach and removes colour instead of blending like the name suggests! I added highlights to the scene with a white gel pen. I love the kitty's eyes so I coloured them green to make them really pop against the hot pink I decided to go with for kitty's fur and also gave them dimension with Judikins Diamond Glaze. Use a Fiskars Celestial moon corner punch on just the two top corners of the scene panel and adhere small pieces of pearlescent orange cardstock to the back of the panel behind the moons. Edge the scene panel with a metallic silver paint pen. Then cut out a larger rectangle panel from decorative hot pink cardstock and corner punch all 4 corners with the Fiskars Celestial star corner punch. Cut a larger rectangle panel from pearlescent green cardstock and round the corners with a Marvy Corner Rounder punch. Adhere all the panels to it with double-sided tape. Punch out a decorative border from black/pale pink polka dots decorative cardstock with a Martha Stewart double edge punch and trim away parts of it until you have what looks like a hugs and kisses design 'OXOXOXO'. Slot the cut out border behind the top panel but weave the 'O' parts of the design so they overlap the scene panel and the 'X' parts go behind. Make a 5" x 7" folded card from teal-green cardstock and adhere all the panels to it with double-sided tape. The pumpkin embellishment is made from mulberry paper and was originally orange. I coloured it black with a paint pen and back-lit the Jack O' Lantern face with a scrap of the orange pearlescent cardstock. Weave green ribbon through another piece of the Martha Stewart border and attach the pumpkin to it with some glue dots. Adhere the whole piece to the front of the card with double-sided tape and you're finished! For more inspiration check out my fellow 3CCC designers! All their blog links are located in my right hand sidebar directly beneath the Third Coast Blog badge! Fabulous colors! Love how you colored the sky!!! Great scene and so humorous! Love the coloring, and what a great image. Now that is creativeness all over the place! I love it!